Click here for an updated list of upcoming events! Lifeteen is a high school faith formation program for Bellingham teens. The program is designed to meet the specific spiritual needs of 9th - 12th grade youth. Our goal is to lead our youth into a deeper relationship with Christ and a fuller understanding of our Catholic faith. Lifeteen meets from 5:00 p.m. - 7:00 p.m. most Sundays on the third floor of the Assumption office building. Along with our weekly meetings, Lifeteen also offers regular social events, service projects, retreats, mission trips, bible studies, and opportunities to get involved with parish life! For more information about all that the Lifeteen program offers, contact our Youth Minister, April Waldrop: april.waldrop@shbham.org, or our assistant youth minister, Kevin Ernest: ernest73.ke@gmail.com. We are always welcoming new 9th-12th grade youth to join us at Lifeteen each week. You don't have to be Catholic to participate, so bring your friends! If you are interested in helping plan and lead Lifeteen meetings and events, consider joining our Core Team! As a Core member, you would help plan Lifeteen meetings, have leadership roles during Lifeteen events, and would also have opportunities to grow in your own faith through service. Please consider sharing your gifts and talents with the youth of our parish. Contact April Waldrop if you are interested. Sacred Heart also welcomes youth grades 10-12 to serve as Junior Core Team members! As a Junior Core member, you gain leadership experience through helping plan and lead Edge meetings and events (for middle school youth). This is an awesome opportunity for high school youth to develop leadership skills and grow in their faith through serving. 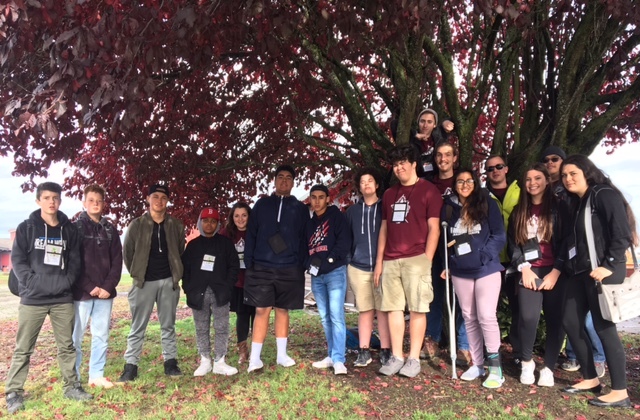 Junior Core members also have special opportunities to go on leadership retreats and have social gatherings of their own to grow together as a community. To apply, contact April Waldrop.